UPSC IFS (Main) Exam 2018: Union Public Service Commission, UPSC has released the admit card for Indian Forest Service (IFS) Main Examination 2018. Candidates appearing for the examination can download their respective admit cards from the official site of UPSC at upsc.gov.in. the admit card will be available from November 12, 2018 to December 10, 2018. 1. The UPSC IFS (Main) Exam 2018 will commence from December 02, 2018 and will end on December 10, 2018. 2. The examination will be conducted in two sessions- Forenoon session (9am to 12pm) and afternoon session (2pm to 5pm). 3. The preliminary examination was conducted on June 03, 2018 and objective type questions were asked. 3. The Main examination will comprise of written test and interview for the selection of candidates in IFS. The number of vacancies are expected to be approximately 110. The main examination will be held in Bhopal, Chennai, Delhi, Dispur (Guwahati), Hyderabad, Kolkata, Lucknow, Nagpur, Port Blair and Shimla. The Main examination will comprise 6 sections which will carry 800 Marks in total. General English, General Knowledge will carry 300 marks each and any two optional subjects will carry 200 marks. For more information on UPSC IFS (Main) Exam 2018 can be extracted from the official site of UPSC at upsc.gov.in. How to download UPSC IFS Main Exam Admit Card? Step 2: Click on the admit card link in the What's new section of the website. Step 3: In the new window, you will have to click on the admit card link again. Step 4: You will first be taken to the instruction page. Read the instructions issued for candidates carefully and if need be take a printout too. Step 5: Click on 'yes' to indicate that you have read the instructions. Step 6: Select one of the two options given - by Registration number or by Roll number. Step 7: Enter your roll number/registration number, date of birth and random image given. Step 8: Submit the information and your admit card will be displayed. Take a printout. Candidates should check the information mentioned on the admit card carefully and in case of any discrepancy should contact UPSC immediately. Candidates must mention their Name, Roll Number, Registration ID and Name and Year of the Examination in all the correspondence with UPSC. The e-admit card for the Indian Forest Service (IFS) main examination has been released by the Union Public Service Commission (UPSC). 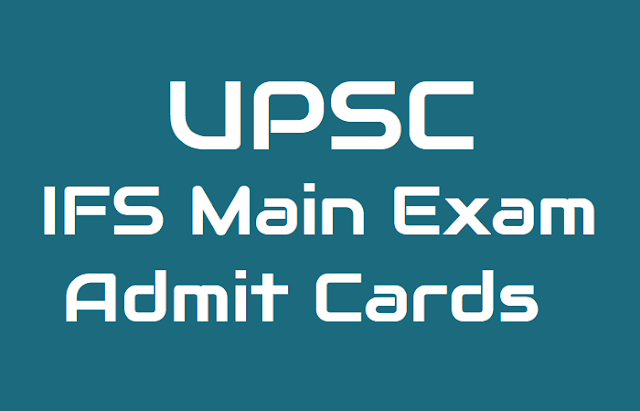 All those candidates who will be appearing for the same are required to download their respective admit cards from the official website, www.upsc.gov.in. Log on to the official website www.upsc.gov.in. Under 'What's new', click on 'e-Admit cards: Indian Forest Service (Mains) 2017'. In the provided fields, enter your registration number/roll number, date of birth and image code. Click on submit. Your admit card will be displayed on the screen. Download the same and take a printout for future reference. 1. The Indian Forest Services (Main) Examination, 2018 will be held in two sessions and each session will have three hours plus twenty minutes per hour (total sixty minutes) compensatory time for Visually Impaired candidates (visual impairment 40% or more). Such candidates will accordingly be allowed three hours and sixty minutes to answer in each session. 2. The Candidates with disabilities, who have been permitted by the Commission to bring their own scribe to write the exam, will be allowed to avail the assistance of such Scribe, only if he/she carries a valid Scribe Admit Card duly issued by the Commission for such purpose. 3. The Candidates with disabilities, who have been permitted by the Commission to bring their own scribe to write the exam, will not be allowed to change their Scribe subsequently without intimating the commission. 4. The scribe will read out the question to the candidate and on candidate’s instruction, will write the answer in the QCA booklet. 5. The scribe will make no gestures, sounds or any other response or communication designed to indicate to the candidate the correctness or otherwise of the answer being recorded by him/her.Any such attempt would entail disqualification of the candidate and stringent action against both the candidate and the scribe shall be taken. 6. The peace in the examination hall or of the other candidates seated in the examination hall should not be disturbed while the scribe reads out the questions to the candidate or when the candidate indicates the correct response to the scribe for marking in the answer-sheet. 7. The candidate and the scribe will sign a declaration that they are aware of/have read the Commission’s instructions regarding the conduct of the candidate and his/her scribe and they undertake to abide by these instructions. 8. No TA/DA or any remuneration will be paid by the Commission either to the candidate or the scribe brought by him/her. 9. Violation of any of the instructions shall entail cancellation of the candidature of the candidate in addition to any other appropriate action that may be taken by the Commission against the candidate/scribe. Both the candidate and the scribe shall be subject to the rules of examination and action will be taken against them for violation of the same as per rules of the examination. “The Commission has uploaded the e-Admit Cards on its website, the eligible candidates are advised to download their e-Admit Card and take a printout thereof. No Paper Admit Card will be issued for this examination by the Commission." 8. Please Read the “Rules/Instructions for the Examination" Published in the Employment News and available on the upsc website www.upsc.gov.in and "Poster containing instructions displayed outside the Examination Hall. 10. Use of Scientific(Non-Programmable type) Calculators is allowed and if considered necessary may be brought by candidates. Programmable type calculators are,however, not allowed in this examination. 11. Possession/Use of Mobile Phones and other Electronics/Communication devices is banned in the examination premises.